How do I change the Power Off and Sleep Timer settings? 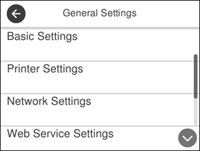 You can have the product turn off automatically if it is not used for a specified period of time. 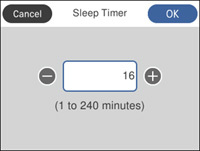 Select Power Off Timer, then select a time period between 30minutes and 12h (12 hours). You can adjust the time period before your product enters sleep mode and turns off the LCD screen. Press the - or + icon to decrease or increase the number of minutes. Press the number of minutes on the LCD screen, select the number of minutes from the on-screen keypad, and press OK.